One way to solve (4.6) is to decompose as a sum of cosines (and sines) and then solve many problems of the form (4.7). We then use the principle of superposition, to sum up all the solutions we got to get a solution to (4.6). Before we proceed, let us talk a little bit more in detail about periodic functions. A function is said to be periodic with period if for all . For brevity we say is -periodic. Note that a -periodic function is also -periodic, -periodic and so on. For example, and are -periodic. So are and for all integers . The constant functions are an extreme example. They are periodic for any period (exercise). Normally we start with a function deï¬�ned on some interval , and we want to extend periodically to make it a -periodic function. We do this extension by deï¬�ning a new function such that for in , . For in , we deï¬�ne , for in , , and so on. To make that work we needed . We could have also started with deï¬�ned only on the half-open interval and then deï¬�ne . Example 4.2.1: Deï¬�ne on . Now extend periodically to a 2-periodic function. See Figure 4.2. Figure 4.2: Periodic extension of the function . You should be careful to distinguish between and its extension. A common mistake is to assume that a formula for holds for its extension. It can be confusing when the formula for is periodic, but with perhaps a diï¬€erent period. Exercise 4.2.1: Deï¬�ne on . Take the -periodic extension and sketch its graph. How does it compare to the graph of ? Suppose we have a symmetric matrix, that is . As we remarked before, eigenvectors of are then orthogonal. Here the word orthogonal means that if and are two eigenvectors of for distinct eigenvalues, then . In this case the inner product is the dot product, which can be computed as . You probably remember this formula from vector calculus. Example 4.2.2: Write as a linear combination of and . This series is called the Fourier series2 or the trigonometric series for . 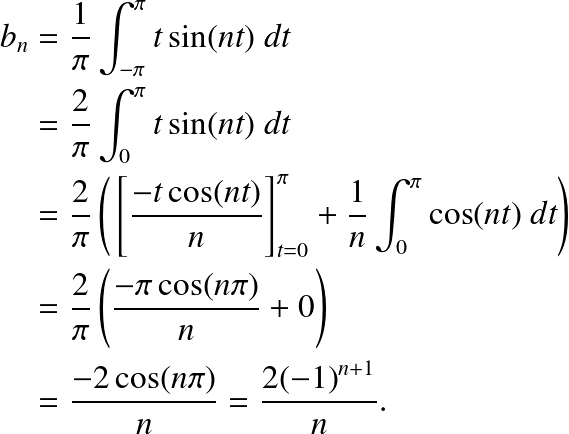 We write the coeï¬ƒcient of the eigenfunction 1 as for convenience. We could also think of , so that we only need to look at and . Exercise 4.2.2: Carry out the calculation for and . for in . Extend periodically and write it as a Fourier series. This function is called the sawtooth. 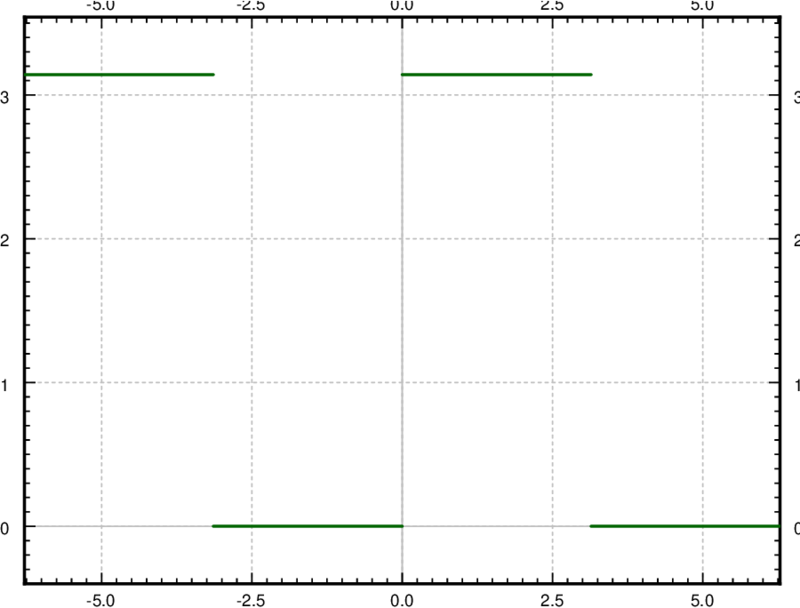 Figure 4.3: The graph of the sawtooth function. Let us move to . Another useful fact from calculus is that the integral of an even function over a symmetric interval is twice the integral of the same function over half the interval. Recall an even function is a function such that . For example is even. Let us write out the ï¬�rst 3 harmonics of the series for . The plot of these ï¬�rst three terms of the series, along with a plot of the ï¬�rst 20 terms is given in Figure 4.4. 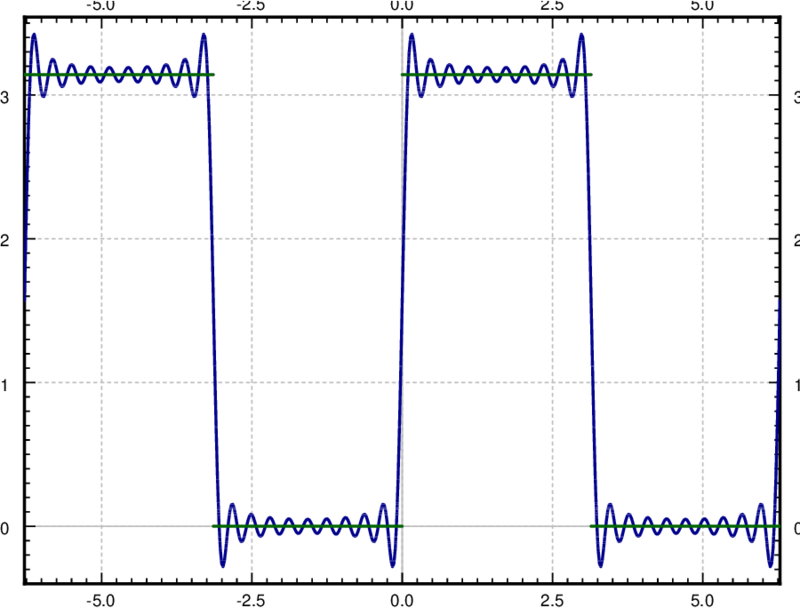 Figure 4.4: First 3 (left graph) and 20 (right graph) harmonics of the sawtooth function. Extend periodically and write it as a Fourier series. 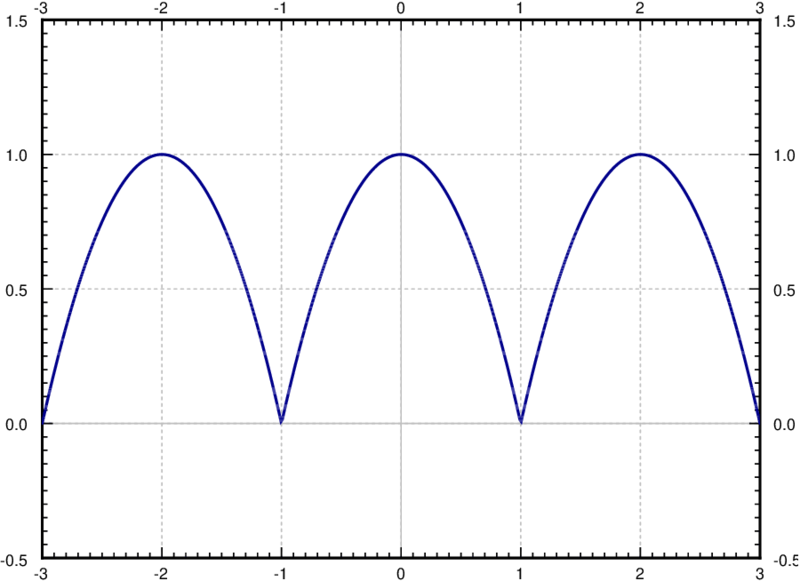 This function or its variants appear often in applications and the function is called the square wave. 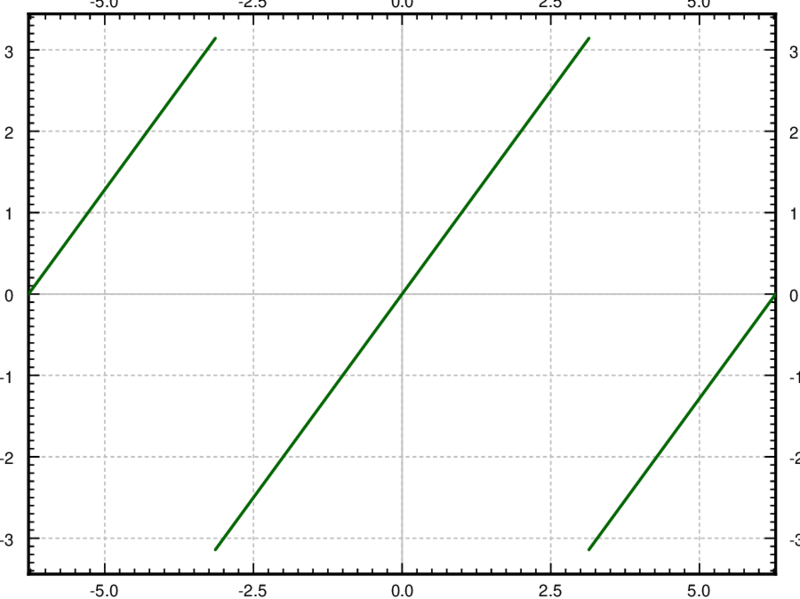 Figure 4.5: The graph of the square wave function. The plot of these ï¬�rst three and also of the ï¬�rst 20 terms of the series is given in Figure 4.6. 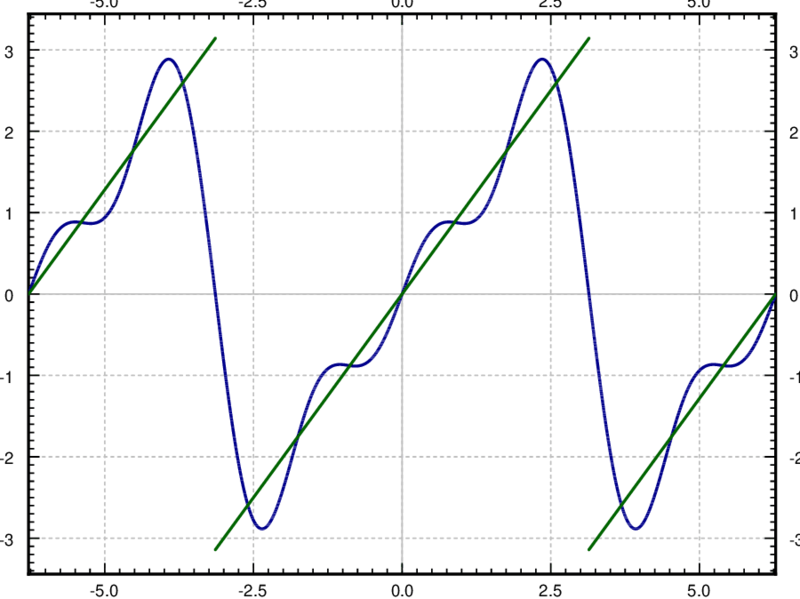 Figure 4.6: First 3 (left graph) and 20 (right graph) harmonics of the square wave function. and extend periodically. The series equals this extended everywhere, including the discontinuities. We will generally not worry about changing the function values at several (ï¬�nitely many) points. We will say more about convergence in the next section. Let us however mention brieï¬‚y an eï¬€ect of the discontinuity. 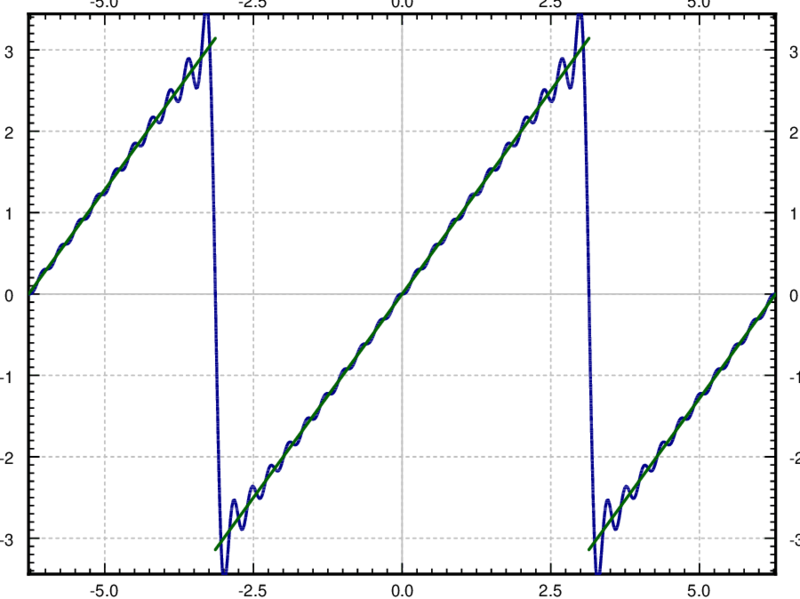 Let us zoom in near the discontinuity in the square wave. Further, let us plot the ï¬�rst 100 harmonics, see Figure 4.7. While the series is a very good approximation away from the discontinuities, the error (the overshoot) near the discontinuity at does not seem to be getting any smaller. This behavior is known as the Gibbs phenomenon. The region where the error is large does get smaller, however, the more terms in the series we take. Figure 4.7: Gibbs phenomenon in action. 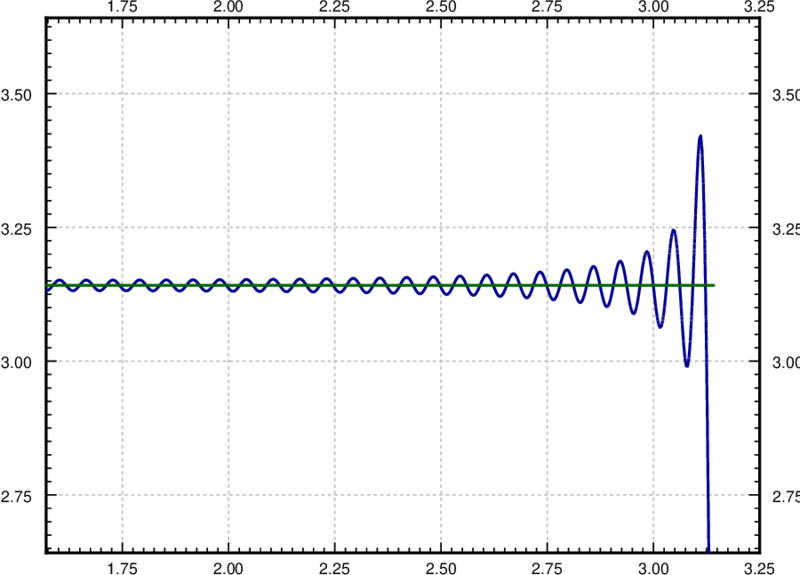 We can think of a periodic function as a â€œsignalâ€� being a superposition of many signals of pure frequency. For example, we could think of the square wave as a tone of certain base frequency. This base frequency is called the fundamental frequency. The square wave will be a superposition of many diï¬€erent pure tones of frequencies that are multiples of the fundamental frequency. In music, the higher frequencies are called the overtones. All the frequencies that appear are called the spectrum of the signal. 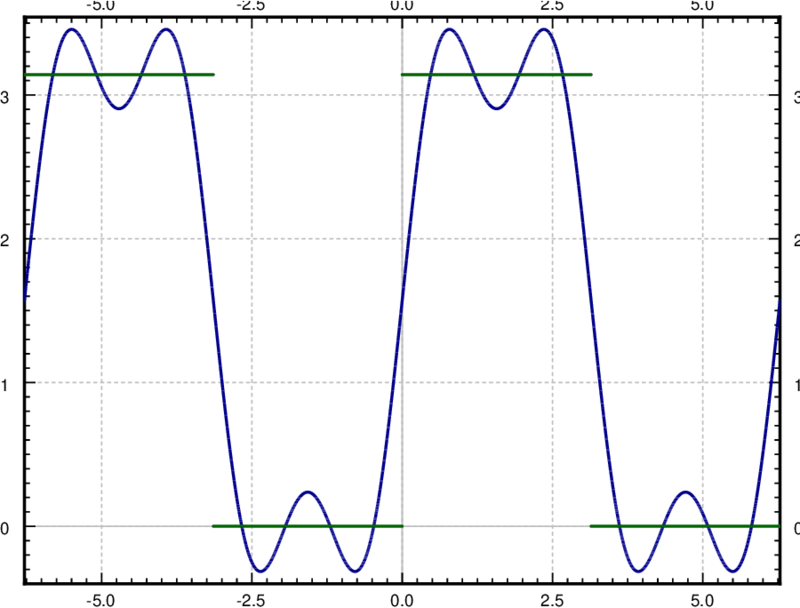 On the other hand a simple sine wave is only the pure tone (no overtones). The simplest way to make sound using a computer is the square wave, and the sound is very diï¬€erent from a pure tone. If you ever played video games from the 1980s or so, then you heard what square waves sound like. Exercise 4.2.3: Suppose is deï¬�ned on as . Extend periodically and compute the Fourier series of . Exercise 4.2.4: Suppose is deï¬�ned on as . Extend periodically and compute the Fourier series of . Exercise 4.2.5: Suppose is deï¬�ned on as . Extend periodically and compute the Fourier series of . Extend periodically and compute the Fourier series of . Exercise 4.2.7: Suppose is deï¬�ned on as . Extend periodically and compute the Fourier series of . Exercise 4.2.8: Suppose is deï¬�ned on as . Extend periodically and compute the Fourier series of . 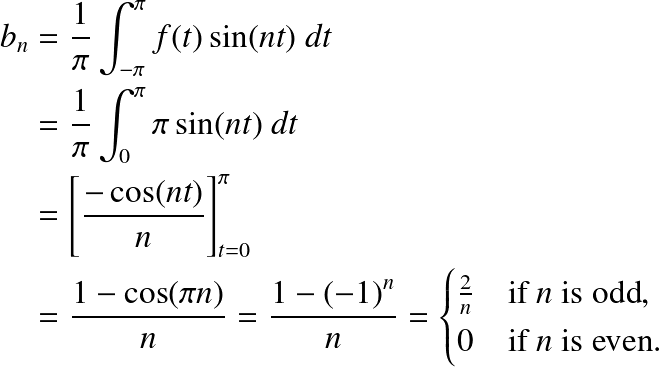 There is another form of the Fourier series using complex exponentials that is sometimes easier to work with. Exercise 4.2.101: Suppose is deï¬�ned on as . Extend periodically and compute the Fourier series. Exercise 4.2.102: Suppose is deï¬�ned on as . Extend periodically and compute the Fourier series. Exercise 4.2.103: Suppose is deï¬�ned on as . Extend periodically and compute the Fourier series. Exercise 4.2.104: Suppose is deï¬�ned on as . Extend periodically and compute the Fourier series. 2Named after the French mathematician Jean Baptiste Joseph Fourier (1768â€“1830).